Happy Halloween from the five of us here on the Gravelly Road. The kids had a great Halloween week. I helped carve pumpkins in Peaches preschool class. Monday night we took the kids to a community Halloween party at Zman's preschool -- painting pumpkins, treats from local business, snacks, crafts and a glow in the dark room. Of course all three kids had fall/Halloween parties during the week. Then on Saturday we went the the fall festival at our church - games, crafts, supper and even a movie. 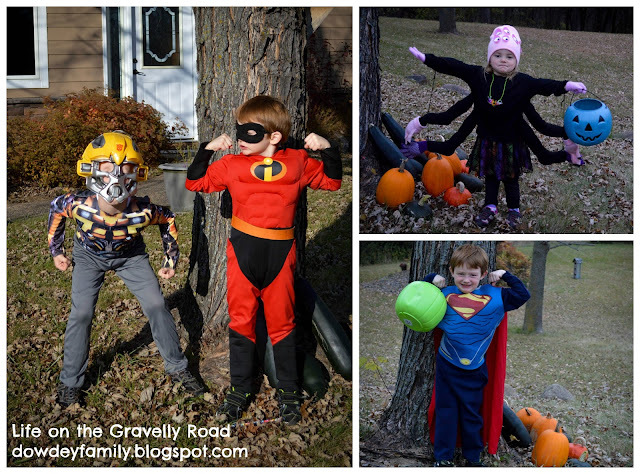 So from our Spider, Superman/Mr Incredible and Bumblebee the Transformer - Happy Halloween.